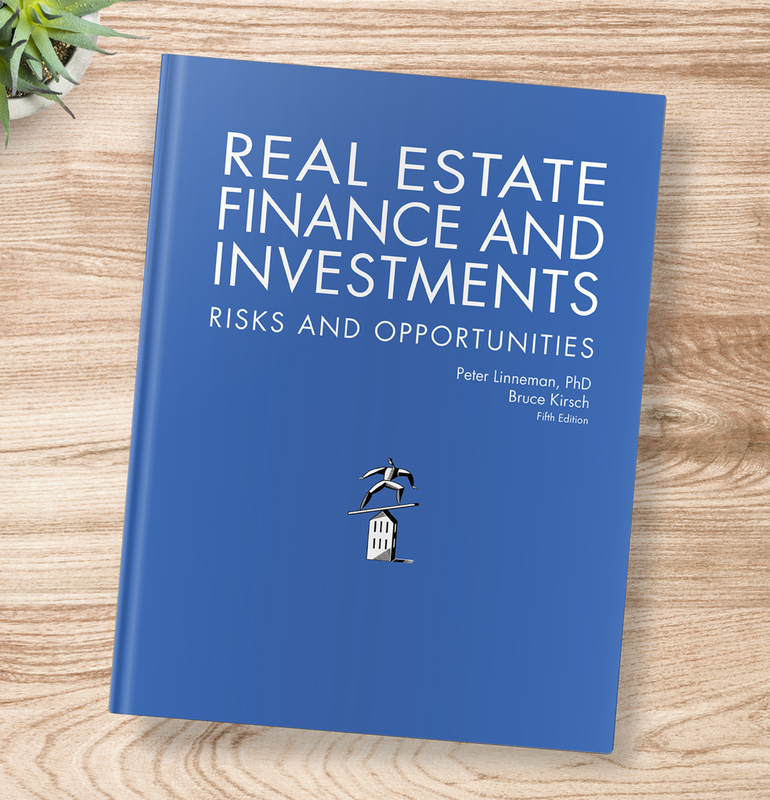 The Fifth Edition of this book, co-authored with long-time colleague, Bruce Kirsch of Real Estate Financial Modeling, is an exploration of the key concepts of real estate finance and investment strategy. The book (published in 2018), is based on Dr. Linneman’s Wharton classes and was written in response to his frustration with texts that concentrate excessively on theoretical detail and literature, while ignoring “real world” considerations. This book not only covers the key theoretical and mathematical underpinnings of real estate finance, but also stresses the ambiguity of investment decision making. The book is designed to help you understand that there is no singular, simplistic, or formulaic answer to any real estate finance problem. Rather, real estate finance is fundamentally driven by judgment and experience, with an eye to the numbers. The goal is to help you evaluate the risks and opportunities of real estate assets and investments as you embark upon the long and unending road of strengthening your judgment. ​The formulas and templates found in the book are intended to help the reader assemble and organize information. Understanding and mastering the tools included in the book will provide you with a strong foundation in real estate finance. This book focuses on what to do thereafter. Knowing how to build a financial model and calculating the internal rate of return in a spreadsheet is not the same as making a profitable real estate investment. Judgment comes one mistake at a time. The Fifth Edition has been updated with timely market data and topic discussion, containing enriched insights from ancillary articles on capital markets, real estate pricing, real estate cycles, private equity funds, REITs, cap rates, and corporate real estate. In addition, the book is enhanced with four new and insightful chapters, which address international real estate investing, long-term metropolitan area growth patterns, return profiles for major real estate investment vehicles under varying market conditions, and the forces changing the real estate industry forever. ​New discussion topics include the co-working office sublet business model, the impact of “shadow inventory” in the hotel sector, investing in China, Brazil, and India, and the nuances of the buy-versus-build decision. The ARGUS chapter has been updated as well. Throughout the textbook, tables and graphs have been reformatted for easier comprehension, and the index of key terms has been expanded significantly, allowing for a more robust search capability. Co-author, Bruce Kirsch, has enhanced the Fifth Edition with an extensive Online Companion website. All the Excel-based figures have been provided on the companion site enabling the reader to efficiently tailor the models with their own assumptions. Also included are “flash cards” for all the key terms used in the book. Readers will be able to conduct keyword searches for all 26 chapters. In addition, the Online Companion provides 60 audio interviews with the authors to bring concepts from the book to life. The book has been adopted by more than 100 colleges and universities, including: The Wharton School, The University of Chicago, The University of Michigan, Notre Dame, Columbia, Yale, New York University, University of California – Los Angeles, Villanova, Ohio State and many more. Corporate adopters, who use the book for training and development of their staff, include: Morgan Stanley, Tishman Speyer, Freddie Mac, Lubert-Adler, Welsh Property Trust, M3 Capital Partners, Stoltz USA, and many others. A bonus audiobook recording of Chapter 1 is also now available below. Chapter 2 | What is Real Estate and Who Owns It? Chapter 14 | Should You Borrow?